The wind and fire of the Holy Spirit hovered powerfully over Mount Sinai – where Moses had remained for the last 40 days and nights. The Children of Israel concluded that no man could survive such an event, so they assumed Moses had died, and promptly returned to their old Egyptian ways, coercing Moses’ brother Aaron to make for them an idol – the infamous “Golden Calf”. 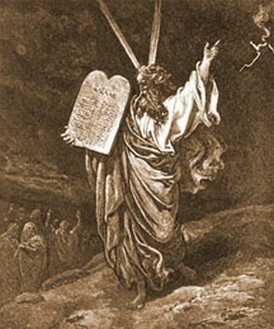 Much to everyone’s surprise, Moses shortly turned up alive – complete with the stone tablets of the Law, which God himself had written. Other details aside, the Children of Israel had now become the People of the Mosaic Covenant – and the Law. 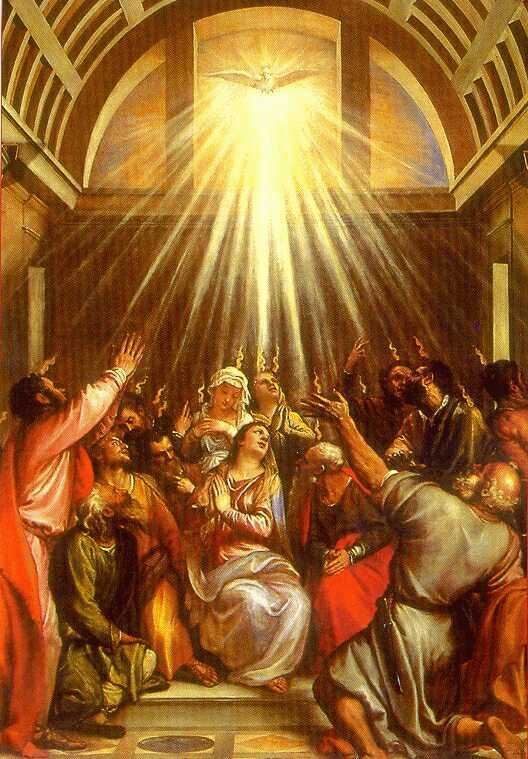 It was Pentecost, about 1450 B.C. Almost a thousand years passed, and the Israelites had once again succumbed to idolatry. This time it wasn’t a golden calf – but rather, the false gods of their neighbors – and they were totally unwilling to repent. The Prophet Jeremiah was sent to help get them back on track, but they refused to hear him. So God permitted the Babylonians to come in, sack Jerusalem, and destroy the Temple. 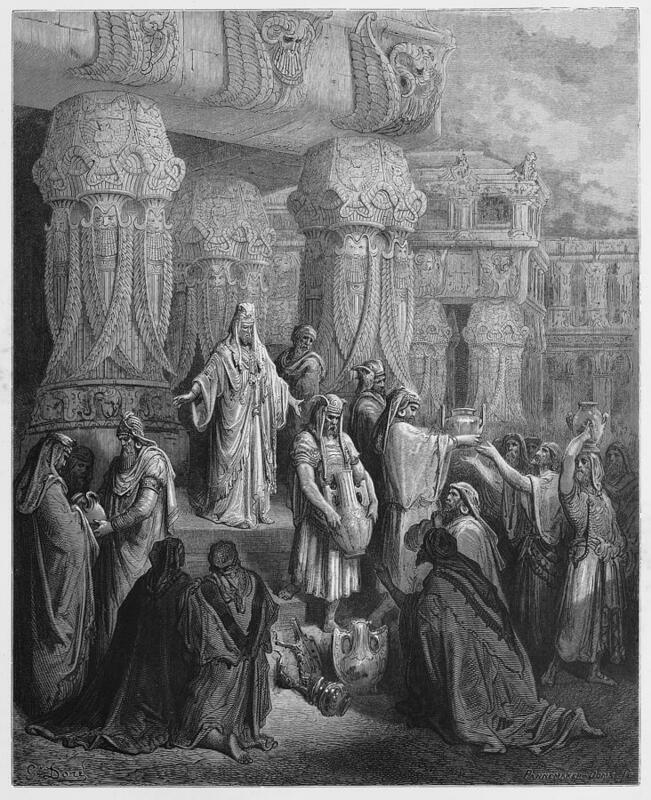 The Babylonians carried off the Temple furnishings, sacred vessels and the surviving Israelites into Babylonian captivity, where they would remain for a time, until the Babylonians themselves were conquered by the Persians. It was Pentecost, about 586 B.C. but it wasn’t looking very good! King Cyrus of Persia – the new ruler of the former Babylonian Empire – was suddenly “moved” by the Holy Spirit – deciding to permit the Israelites to return to Jerusalem, so they could rebuild both the city and the Temple. Cyrus also financed the entire operation – as well as restoring to the Israelites all of the plundered Temple furnishings and sacred vessels – so everything might be ready for the arrival of the coming Messiah. as the Day of Pentecost, around 539 B.C. and things were definitely looking up! The Risen Christ had bodily ascended to Heaven ten days earlier. 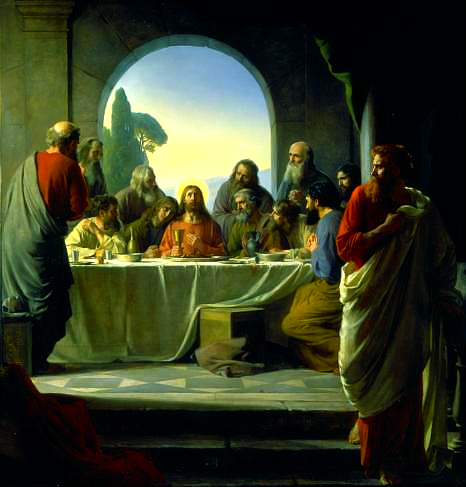 Mary and the Apostles were gathered in the upper room of the Jerusalem Cenacle – the same place that Jesus had earlier instituted the New Covenant in his blood – at the Last Supper – and the place where the New Covenant (Catholic) Church would soon be born. All were fervently waiting and praying for the descent of the Holy Spirit – and the “power” Jesus had promised to them. Inside, it sounded like wind and thunder – soon to be complemented by descending “tongues” of fire. To those in the streets, it would have looked more like a reenactment of the supernatural events that took place above Mount Sinai, almost 1500 years earlier – which it was! Since this was in fact, 50 days after Passover (technically, the Feast of First Fruits, some three days after) – in the Hebrew, Shavuot – in the Greek, Pentecost – the day when all observant Jews come to Jerusalem, specifically to celebrate Moses’ reception of the Tablets of the Law, from God – something like this would not have gone unnoticed. Then the apostles came out into the street to explain. Acts 2:5-12 Now there were dwelling at Jerusalem, Jews, devout men, out of every nation under heaven. (6) And when this was noised abroad, the multitude came together, and were confounded in mind, because that every man heard them speak in his own tongue. (7) And they were all amazed, and wondered, saying: Behold, are not all these that speak Galilean? (8) And how have we heard, every man our own tongue wherein we were born? (9) Parthians and Medes and Elamites and inhabitants of Mesopotamia, Judea, and Cappadocia, Pontus and Asia, (10) Phrygia and Pamphylia, Egypt and the parts of Libya about Cyrene, and strangers of Rome, (11) Jews also, and proselytes, Cretes, and Arabians: we have heard them speak in our own tongues the wonderful works of God. (12) And they were all astonished, and wondered, saying one to another: What meaneth this? It was the Day of the first Christian Pentecost, about 33 A.D.
and the world rejected him. Salvation had been killed, and had risen again. so all the promises of Jesus Christ were duly fulfilled. Mark 13:1-2 And as he was going out of the temple, one of his disciples said to him: Master, behold what manner of stones and what buildings are here. 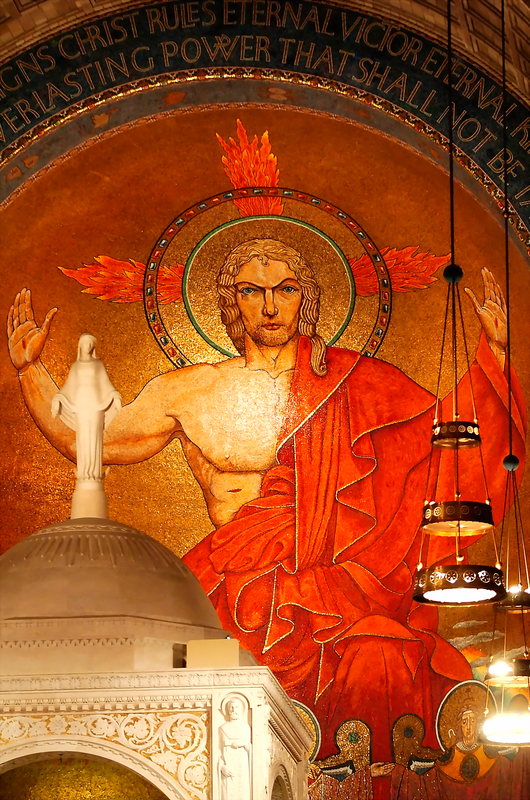 (2) And Jesus answering, said to him: Seest thou all these great buildings? There shall not be left a stone upon a stone, that shall not be thrown down. The Roman General Titus and his legions had nearly encircled the city of Jerusalem – but they inexplicably stopped short – for one whole day. Those “in the know” – mostly Christians – took good advantage of the reprieve – hastily abandoning the city – much as Lot had narrowly escaped the sudden destruction of Sodom and Gomorrah. But now it was Sunday, the encirclement was complete and the siege was on. 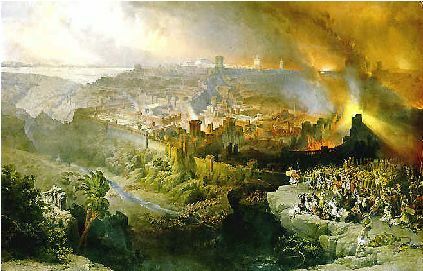 Over the next six months – apparently just in time for the fall Feast of Tabernacles – the Temple would be burned to the ground and totally destroyed, hundreds and thousands of Jews would be killed, the sacred Temple vessels would once again be carried off, and Jerusalem would never be the same. The siege began on Pentecost, 70 A.D.
were still alive to witness the events. would be converted to Christianity. in the image of Heaven. Revelation 10:5-7 And the angel whom I saw standing upon the sea and upon the earth lifted up his hand to heaven. (6) And he swore by him that liveth for ever and ever, who created heaven and the things which are therein, and the earth and the things which are in it, and the sea and the things which are therein: That time shall be no longer. (7) But in the days of the voice of the seventh angel, when he shall begin to sound the trumpet, the mystery of God shall be finished, as he hath declared by his servants the prophets. 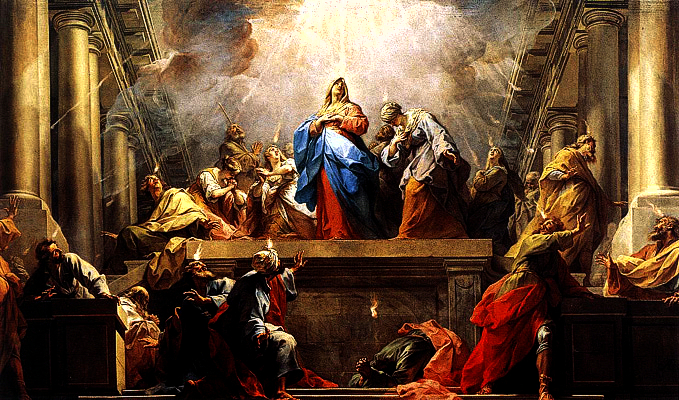 The “Grand finale” of the “End of the Age” will likely begin on Pentecost and continue for six months – right up to the time of the old Feast of Tabernacles – which according to the old calendar – is also when Jesus Christ arrived here on earth – the first time – as a helpless infant. Revelation 19:11-16 And I saw heaven opened: and behold a white horse. And he that sat upon him was called faithful and true: and with justice doth he judge and fight. (12) And his eyes were as a flame of fire: and on his head were many diadems. And he had a name written, which no man knoweth but himself. (13) And he was clothed with a garment sprinkled with blood. And his name is called: THE WORD OF GOD. (14) And the armies that are in heaven followed him on white horses, clothed in fine linen, white and clean. (15) And out of his mouth proceedeth a sharp two-edged sword, that with it he may strike the nations. And he shall rule them with a rod of iron: and he treadeth the winepress of the fierceness of the wrath of God the Almighty. (16) And he hath on his garment and on his thigh written: KING OF KINGS AND LORD OF LORDS. Revelation 22:12-13 Behold, I come quickly: and my reward is with me, to render to every, man according to his works. 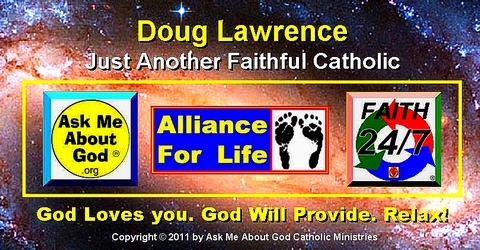 (13) I am Alpha and Omega, the First and the Last, the Beginning and the End. 4th century Pentecost miracle: Fire in the sky over Jerusalem unifies Christians and Pagans alike, in holy terror. It was called by the people “the day the sky caught fire.” At about 9 in the morning on May 7, 351, the feast of the Pentecost, the people of Jerusalem gathered in the streets, pointing to the sky in frightened shock. Tongues of flame were roaring across the horizon forming a gigantic blazing Cross in the sky. The apparition, “brighter than the sun,” extended from Golgotha to the Mount of Olives – about two miles – and was seen by everyone in Jerusalem. It remained extended over the city for several hours. Many people fell to their knees, beseeching God to spare them from annihilation. Others went to the Churches to pray and ask forgiveness for their sins. 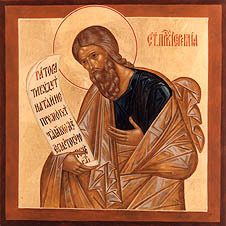 But one man, the newly elected Patriarch of Jerusalem Cyril (315-386) bowed his head and gave thanks to God for this blazing sign from Heaven. Just in time for Pentecost: Physical Manifestations of the Holy Spirit – From Genesis To Revelation. God has apparently made many more appearances in our realm of existence than most of us can possibly imagine, and even when those events are duly recorded in scripture, they are often missed, or mistaken for something else. Click the link below to view a 9-page compilation of virtually EVERY appearance God has ever made (at least as recorded in scripture) and be sure to spend a little extra time towards the end … contemplating the events of the first Christian Pentecost, and their direct aftermath. Most of the parishes in my area let young people get confirmed even though they do not go to church every Sunday. The Confirmandi promise the Bishop they would abide by the precepts of the Church, but are not even required by their parishes to go to church on Sundays during confirmation class years. So after confirmation the confirmed just move on [been their and done that].They forget about their commitments to God and the Bishop. The policy is “everyone gets Confirmed” regardless, whether they obey the precepts of the church or not. This policy of the youth directors is leading to the mass exodus of college students and 20 somethings from Sunday Mass.